Peggy and I met Beth Gross of Farm House Candle Co. last fall when she stopped in to show us her line of locally made soy candles. To say it was love at first sight (and smell) is an understatement. The warmth of Beth's personality radiated across the room as soon as she walked through the door, and I think we knew even before we started smelling her unique scents that we would be placing an order before she left that day. One of the things Peggy and I naturally focus on in the process of curating our collection is the story of the products. Like most people, we find it's the story that creates the connection and highlights the special qualities of the product, and we enjoy passing these details on to our customers. Farm House Candle Co. is a prime example of a product with a nice story. When we asked Beth how Farm House Candle Co. began she told us "I have always been a stop and smell the candles kind of gal! I love burning them especially in my kitchen but had a hard time finding scents that were natural smelling and did not interfere with what I was cooking. So about 4 years ago I started experimenting with mixing fragrances and began making my own soy candles. I chose soy wax for its natural qualities and wanted fragrance combinations that were fresh, and most of all unique! After much trial and error I started getting scents I really liked, and so did my friends and family! They became my go-to gift for birthdays and Christmas and before long I started getting special orders! With all the positive feedback I was receiving, I decided to take the plunge and start Farm House Candle Co. It has been a whirlwind, crazy ride since and I'm loving every minute!" In addition to the Farm House Candle Co. story, Peggy and I decided to add Farm House candles to our collection because of the unique attributes they offer compared to the larger candle producers. Beth explains "what sets us apart [from our competition] is our unique mixture of fruit, herb and masculine aromas. Our candles are crafted of 100% natural soy (from Midwest farms) for a clean carbon neutral burn. Every candle is hand poured in small batches to ensure the highest quality and performance." 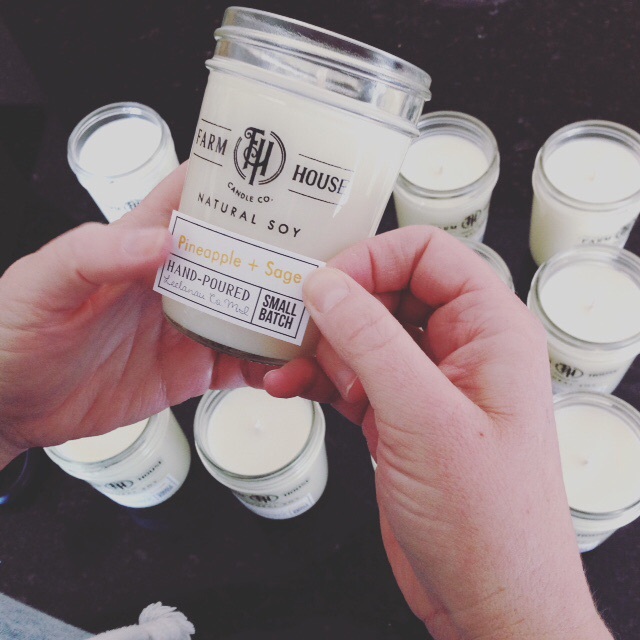 We love that Farm House Candle Co is the story of the evolution of a passion in to a business. It's been really fun for us, as customer of Beth's, to watch her continue to explore new scent combinations and create candles that perfectly correspond to the moment. One of our favorite scents of hers right now is Sea Salt Vetiver which is perfectly reminiscent of days at the beach. We're also really excited about our own custom scents which Beth worked with us to create. Peggy is an avid red currant lover and so we asked Beth to get to work on creating a candle with true Red Currant scent. We also wanted a candle that worked for both men and women and Beth suggested Orange + Black Pepper which perfectly embodies citrusy masculinity - if there is such a thing, and so far every time we burn it in the store people exclaim over how good it smells. To learn more about Beth at Farm House Candle Co. visit her website: Farm House Candle Co. or follow her on Facebook or if you find yourself in Fishtown, stop in to see her custom candles at Leland Gal which have been wrapped in fun and festive Leland Gal prints.